Although this article talks mostly about clipping, it’s important to first discuss bathing, cleaning and shampoos. Not every dog needs clipping, but most dogs need regular cleaning. Read our guide to bathing dogs and pay special attention to our comments about dog shampoos. Oscar’s a good dog and his story is sadly all too familiar. Like many breeds, his coat needs regular clipping, and he’s been going to grooming salons since a puppy. One time, he was accidentally cut during a groom. This seemed to start his fear of grooming, and the more he struggled, the worse each experience became. 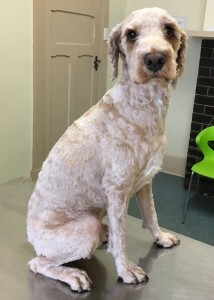 Eventually he reacted so much that his regular groomers said they couldn’t do it any longer. His owners tried one groomer after another, but each time they would get a phone call: “sorry, but we just can’t clip him”. 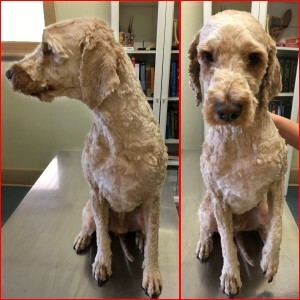 As his coat became more matted and full of grass seeds, it started being more than just a cosmetic problem. In desperation his owners called us. Now, let’s make this clear. Although this is a job we often do, grooming salon we are not. More on this later, but it’s the last resort to need a vet to clip a dog under sedation. 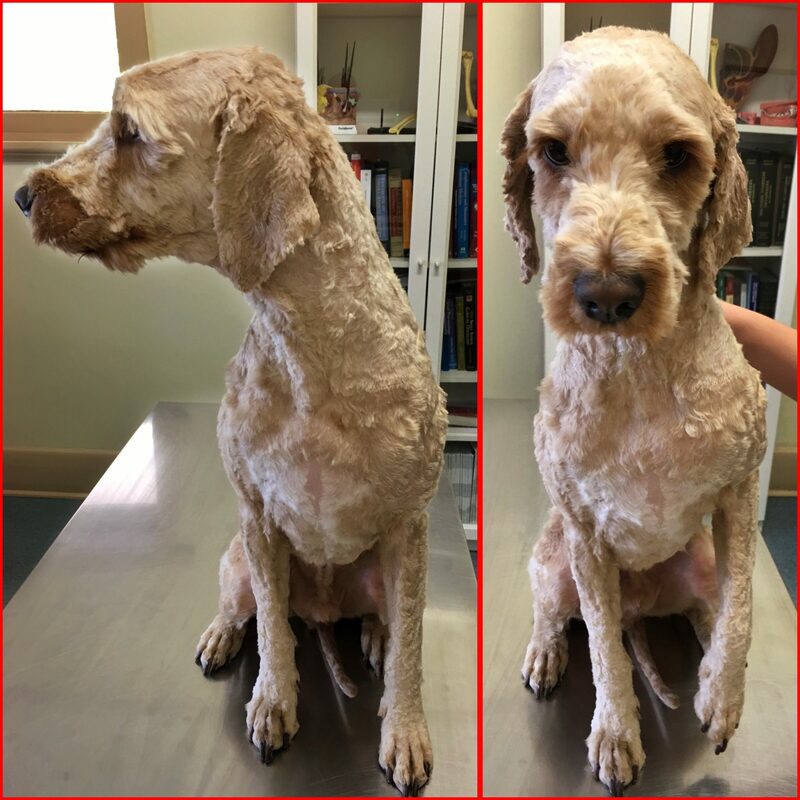 For Oscar, we’ll always be there to help, although we’d much rather see him happily groomed by a professional. The pictures of Oscar show what you can expect from a ‘veterinary’ groom; an all-over short clip (no styling). He’s a lot more comfortable but a professional groomer would do a much nicer looking job. 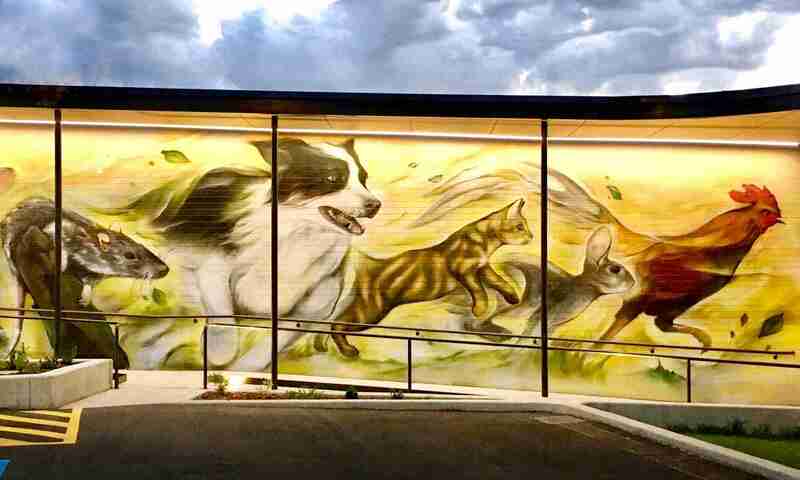 When you get a dog, or move to a new area, use the experience of the locals. Read genuine customer reviews. We find that Google reviews are the most reliable, but there are also reviews on Facebook and elsewhere. you just have to follow your gut instinct. If the person is caring and patient with you, they are also likely to be the same with your pet. Don’t be afraid to ask hard questions. Who does the actual dog clipping in the salon? How much experience do they have grooming dogs? Where have they worked before? Are they happy to do all breeds? Is there a standard clip, or do they do breed-specific cuts? Does the salon gets involved with training or outside activities? Seminars, shows and competitions encourage the pursuit of excellence and show a high level of commitment. Can you view the salon at a pre-arranged time? (Generally it’s not advised for you to stay during the grooming though). Where are dogs kept when they are not being groomed? Do they ask for vaccination certificates? If you are happy with your dog groomer, the safest thing is to keep going there. If you get many positive reports about a salon, consider driving past others to get there. If your dog is happy to go to the grooming salon, it’s a good sign. Is There A Difference Between Salons And Mobile Groomers? This is a tricky question and it’s not fair to give a simple answer. There are definitely good mobile groomers in Adelaide, and if you hear of one, try them out. It can be easier and cheaper to run a mobile grooming service and you may find these groomers have lower prices. The problem is that training and experience vary a lot. Unfortunately we see more grooming problems from mobile operations that salons with a physical location. The advantage of shopfront salons is that they usually have a long, established history, and therefore a reputation to maintain. The groomers themselves are often trained by a senior staff member and have other staff around them to help when needed. It’s a bit like us at Walkerville Vet; having three vets allows us to use each others’ experience and special skills when needed, and allows us to train junior vets in a supportive environment. What Age Do I Start Getting My Puppy Clipped? We advise you make an appointment as soon as your vet says your puppy is safe to go. Our vaccination program finishes at 10 weeks and puppies can go out from 11 weeks of age. The critical period for early socialisation in puppies finishes at around 16 weeks of age. Positive activities experienced during this time are far less likely to cause fear, stress and anxiety for the rest of the dog’s life. On the other hand, new experiences that don’t begin until after 16 weeks may always be scary or unpleasant for your dog. For best results, your puppy should have a fun, gentle and pain free grooming experience before this time. If they don’t you risk your puppy always being scared of grooming. Once a dog is scared, it doesn’t take much to make it worse. Professional groomers understand this important step, and will usually suggest an introductory visit. This may just be a very quick trim, or bath, or maybe a nail clip. The aim isn’t to do a thorough groom; it’s to set your puppy up for a lifetime of positive experiences. Above all, remaining calm, patient and positive at all times. Like always when training puppies, you need to recognise that some times they just aren’t in the right frame of mind and you need to stop. Which Dog Breeds Need Regular Grooming? We wish all dog owner knew this before choosing a puppy. Registered breeders should give good grooming advice before you adopt your puppy but it doesn’t always happen with other puppy sellers. 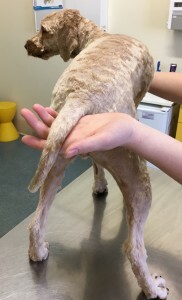 How Often Do Dogs Need Clipping? Of course, it depends on the dog and your preferences, but anywhere from 1 to 12 weeks may be necessary. 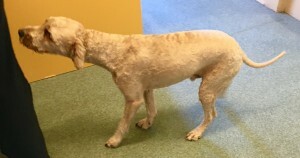 In the beginning, grooming is done more frequently, but many adult dogs can be stretched out to 8-12 weeks. Always follow your groomer’s advice; if your dog’s coat gets matted it gets very hard to groom them well. Grooming is required very frequently for large breeds with long coats, like Bearded collies and Old english sheepdogs. My Dog Hates Grooming. What Can I Do? If the coat is matted and your dog is already distressed by grooming, you may have no option but to ask a vet nurse to clip off the coat. This will be done humanely, using a sedative sufficient to render the dog unconscious. It won’t be an attractive groom, but it will make your dog feel better. This page shows examples of a dog clip so you don’t get a nasty surprise. If you can once again attend a groomer, the key is gentleness, patience and regularity. Talk to a groomer about the problem first, and make sure they are happy to help. 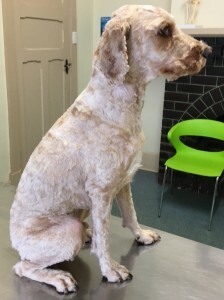 Do only as much as your dog can tolerate with each visit, even if for the first few visits all you are doing is getting your dog accustomed to the clippers again. Supply plenty of treats and don’t be tempted to do too much too quickly. Progress is in slow steps but setbacks can take you right back to the start. Our experience tells us that these three local grooming salons provides a high quality service with few problems. Have a look at their Facebook pages for examples of what a real groom can look like. 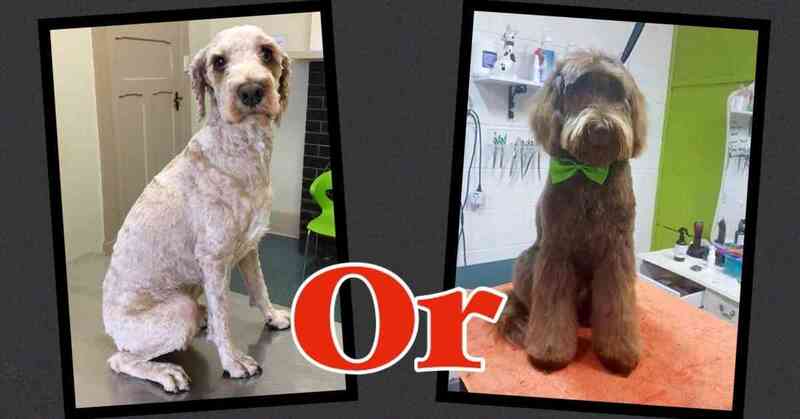 If there is another grooming salon you prefer please let us know.